This project has become (by far) the biggest source of traffic to my humble blog, which makes me happy. However you’ve found this page, I hope you’ve found it useful. Given its popularity, I decided it was time to finish what I’d always had in mind for it: to make it look nice in InDesign and distribute it as an ebook. My employer thought it was a good idea too, and the ebook is now now available at a reasonable price as a pretty 32-page PDF, an intentionally convenient length (32 pages is an even signature) suitable for printing and binding on your own. UPDATE (7/14/2017): If you click through the last link in the previous paragraph, you’ll no longer find a purchase option for this ebook. Sadly, O’Reilly Media (for whom I no longer work) recently stopped all direct sales of ebooks from their own website, choosing to distribute only via their Safari subscription platform and Amazon. Because this product was always designed primarily for PDF format (and ultimately created in only that format), it was never available on either Safari or Amazon, which require different formats, which means it’s more difficult to find as an ebook. But thankfully, it’s still available at the Maker Shed (Maker Media inherited the book when it spun off as a separate division from O’Reilly Media), so if you’re still looking for a pretty PDF, you can find and buy it there. 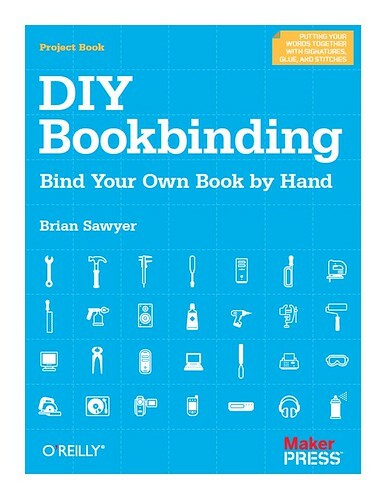 i have a quick question how much would you sell a book that you wold bind? like a clear journal or something like that? Jessica, I’m not sure I could get the kind of money I’d need to make selling them worthwhile. Binding your own books is a labor of love and (at least as I’ve done it) requires much more work than can be adequately compensated. I write only a little bit of english , but I can say your work is beatiful. Like you says, binding your own books is ahard work, but , when you can see a book finished , ahhhhh, it is magical sensation. Very nice of you to show detailed images in the posts. Fanfreakingtastic. Thank you so much! Hi, You have some really Great articles on your blog. I also like the theme and the layout as well. excellent work!